The Victory Services Club near Marble Arch has become a favourite location for our late November dinner and social, and thus a large contingent of us reported for an excellent dinner in their modern but elegant Club Dining Room, adjourning afterwards to the large, pleasantly furnished bar. Although conveniently situated, this venue keeps us well away from the pre-Christmas hurly-burly of central London. Typically, two of our most affable members, Keith and George, relax in reflected glory (left). 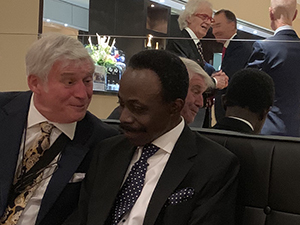 Our Society has been fortunate to again be invited to the splendid annual City of London Election Banquet of the Worshipful Company of Bakers, the second-oldest City Livery Company at The Mansion House, in the presence of the Lord Mayor of London. 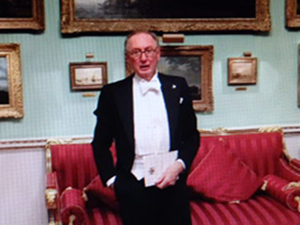 Thus on November 26th a group of us, many in white tie, enjoyed an excellent dinner, serenaded by a military band, and an amusing speech by the distinguished judge, Sir Terence Etherton, Master of the Rolls. SATS member and former army colonel, Andrew (pictured) wrote afterwards; “What a great evening you arranged! Thanks to Wim for facilitating the invitations. I've been to several of these, but this was the one of the most enjoyable, as we had such a good crowd”. A little bit of France off Charing Cross Road! 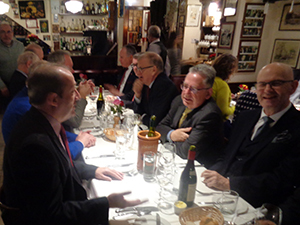 this charming French club-restaurant, which has been described as "a bastion of all that is French for over 40 years". Several of our members have a foot in both camps so we get to sample its delights! Not only is the food very good, and the ambience does give the impression of an intimate brasserie in France, but the service puts most London restaurants to shame, so that despite our number, no pre-ordering is ever required and every dish is delivered promptly and as it should be. 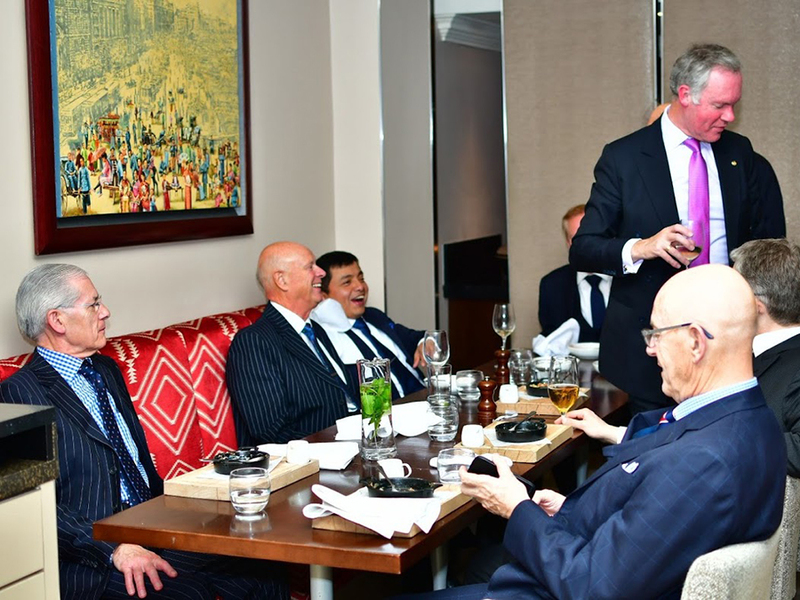 While our October social at the Kenilworth Hotel in Bloomsbury was not expected to break records, it proved a very pleasant, relaxed and lively evening where everyone stayed late - always a good sign! The staff are very friendly and helpful here, adding to the good atmosphere. The dinner was very good and reasonably priced, and one advantage here is that the restaurant and bar areas converge. There were plenty of very comfortable seats in the latter, encouraging us to converse well into the evening. 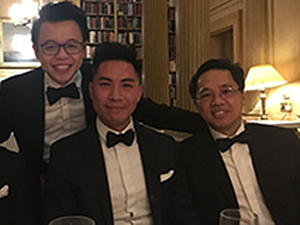 The record number of SATS members who dusted off their DJ and fixed their black tie for a dinner at the distinguished Travellers Club on October 12th were in for a treat. The dinner was arranged in the large and beautiful Library, and the club had laid on generous amounts of Champagne to welcome us, with their excellent wine flowing freely throughout the meal. No wonder the group pictured (left) look so delighted!